I am making a Golf game for the Channel F. After 24 hours, I have a version 4. To hit the ball, make the club head touch the ball and press fire + the direction you want the ball to move. The ball and man can move in 8 different directions. Right now the ball doesn't stop, so once you hit the ball the game freezes except the ball keeps moving. I made the ball stop moving. This is because I added a power meter for the shot. The longer you hold down fire, the farther the shot will be. Then, when you're ready, with fire still pressed, move the joystick in the direction you want the ball to go, then depress fire. Then, once the ball stops, the guy is placed at the ball and you shoot again. If you get to the hole, the game doesn't know it yet, so you just keep shooting. Also, you can land in the water and nothing bad happens. I plan to change both those things when I get around to it. It works well so far, at least after reading your instructions how to control it. At first I tried to figure it out on my own and had to try a few different methods before finding out it works just like you described it. Added collision detection for hole, water, and boundaries. Here is a short YouTube video of the game. Added a visual representation of the power meter. Appreciate the work being done on Channel F homebrew, something to inspire me one day to actually get something working myself! Golf was surprisingly common on the 2nd gen machines, I wonder why the Channel F never attempted it. I wondered that too. 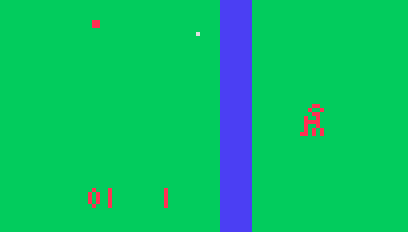 The Channel F has the perfect colors for it: green for the grass, blue for water, white for ball, red for golf player. Which is why I began work on it.